The honeymoon is over. Now what?Originally written as Facebook posts to his engaged son, After the Honeymoon features ninety devotions that provide insight and wisdom from Rod Loy based on biblical principles and his own twenty-seven year marriage. 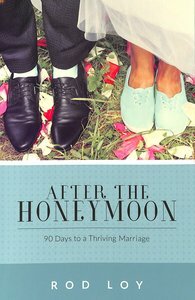 Whether seeking to start a marriage off on a solid basis or wanting to rekindle and strengthen their marriage, this book provides couples with unique ideas to build a thriving relationship.Includes:90 days of daily devotions90 date ideas under $10Examples from real life couplesNow that your wedding is over, you can make your marriage great! Rod Loy is Senior Pastor at First Assembly of God in North Little Rock, Arkansas. Under Rod's leadership, the church has grown to over 3,000 in average weekly attendance and has helped plant more than 1100 churches in 63 nations. Rod's unique approach to leadership has led him to adventures in the "Real World," including working as a volunteer lifeguard and elementary school assistant.